One of the most time consuming and tedious parts of regular computer maintenance is backing up personal files and other data. These files go beyond your typical documents and photos but also include Windows settings like desktop wallpapers or layouts for programs like Microsoft Word or your internet browser. 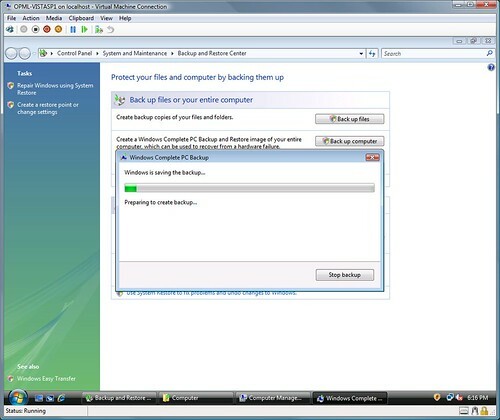 Even though the Windows Back Up process can be time consuming and/or complicated for some computer users, it is crucial that backups are made from time to time through regular computer maintenance. Microsoft Backup is built into operating systems going back to Windows XP and is also a part of the newer Windows 7. If this process is not on your list of priorities, rest assured that FreeComputerMaintenance.com offers an automated computer maintenance program that schedules and takes care of essential computer maintenance tasks, including Windows Back Up for personal files and other data. Making back-up copies of your computer’s hard drive is important in the common event of a fatal computer error. An electrical short, computer virus, flood, spill or other catastrophic event can render your current hard drive settings useless. In such an event the only two options are to reinstall Windows with the possibility of losing all the information stored on the hard drive, or restore the hard drive to previous settings and functionality using a back-up. Backing up your computer can be done on the hard drive itself, which can be dangerous if the hard drive is physically damaged. Backing up can also be done on a CD, DVD, USB thumb-drive. Windows Backup requires a certain amount of free hard drive space which is why performing regular computer maintenance either manually or through an easy to use automated program becomes important. Other computer maintenance tasks like Disk Cleanup and Disk Defragmenter allow the maximum amount of free space to become available for daunting tasks like Windows Backup. These additional computer maintenance programs not only allow Windows Backup to record personal files and other data but also speed up your computer. Windows Backup is a part of Free Computer Maintenance and helps users easily automate various aspects of computer maintenance even if you are not a computer whiz.